(CNN) – Rep. Michele Bachmann tied religion into comments about Florida's severe weather, saying Sunday at a prayer rally that there's "a spiritual hurricane in our land." The Minnesota congresswoman and former GOP presidential contender made the remarks at the rally in Tampa ahead of the Republican National Convention, the first day of which was canceled due to weather conditions related to Tropical Storm Isaac. "At this moment in time we're quite literally looking at a hurricane here in Florida. We're looking at a political hurricane in this country. We are looking at a spiritual hurricane in our land. And it is time for each one of us to show up and suit up and stand up and realize that in this time and in this day we pour it out for Him," said Bachmann, a tea party activist, at the event organized by the Florida Family Policy Council. Forecasters project Isaac will make landfall as a Category 2 hurricane on Wednesday somewhere along the Louisiana or Mississippi coast. Bachmann's speech may jog political memories of comments she made last August, suggesting 2011's Hurricane Irene was an act of God. 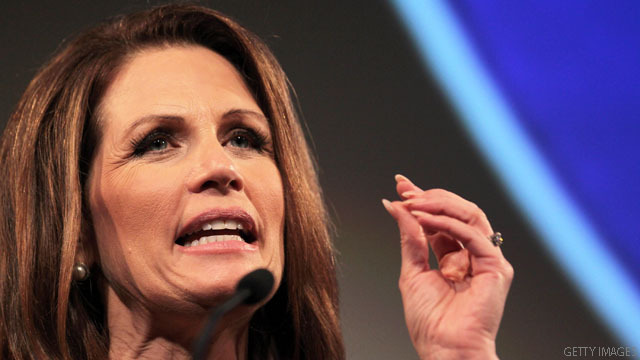 "Washington, D.C., you'd think by now they'd get the message," Bachmann said at a town hall in Florida last August while campaigning for the GOP presidential nomination. "An earthquake, a hurricane, are you listening? The American people have done everything they possibly can, now it's time for an act of God and we're getting it." Her campaign press secretary at the time, Alice Stewart, later said the congresswoman's remarks were a joke. Bachmann herself is the joke.